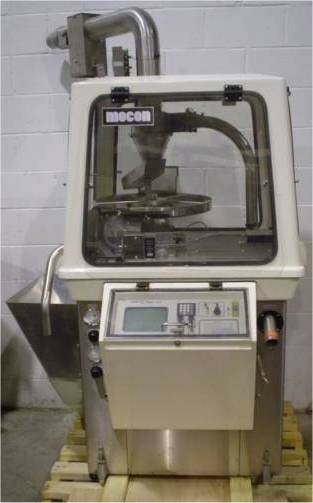 Used Mocon Capsule Inspector/Sorter Weight Verifier Model Vericap 2500. Features: Size “2” Change Parts, Stainless Steel/Sanitary contact parts. Comes with CRT Display which gives total counts of capsules found “high”, “low”, and “good”, machine run time, selected weight limits, operating speed. Electrics: 1Ph/60Hz/120Volts, 5 amps. (Air Required) Last used in a large pharmaceutical facility. Delivery Time: Immediate.